I’m a fan of Nicki. When I visited her website, I was underwhelmed. Let me first start with the good points. Nicki Minaj’s UI/UX designers resolved to prioritize the color schema — a 2D design with Nicki’s signature colors, black text against a pink background, a splash of white text here and there — at the expense of damaging the ease of ability with which one can use the page. Admittedly, it provides an aesthetically memorable experience — because everything is picturesque, the next time you visit you realize the buttons lie in the fine print. However, because Nicki’s theme pervades the website so much, it forces everything to be so uniform that it’s hard to detect what you’re looking for. Why does it prove to be more unlearnable? The navigation bar has no background, the black category names blend in with the background “Nicki Minaj” so well that it takes a while for me to register that it is a navigation bar. Additionally, there is no change when I hover over the words, so it’s less likely that I know to click on it. The placement of the navigation bar of her website decreases learnability and efficiency. 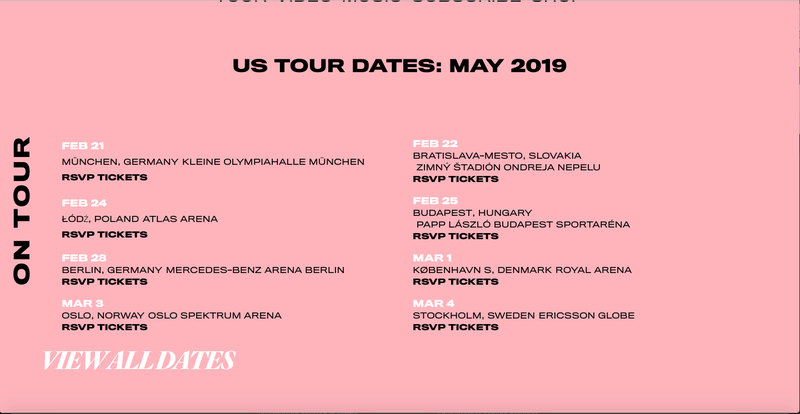 If you click on “Tour”, for instance, the website auto-scrolls down to the part of the page that displays information on her tour. When I first used the site, I scrolled down and realized I wanted to check out merchandise the website had. Most websites fix the navigation bar so you can scroll and refer back to the navigation bar if needed, so I had assumed it was standard. Imagine my disappointment in Nicki’s UI/UX designers when I hesitated and was at loss at what to do because I didn’t realize I had to scroll back up to see the navigation bar. Even if I were a long-time user, and I knew where the navigation bar was, I would have to inefficiently scroll all the way back up in order to locate the necessary feature of the navigation bar to click on. Figure 1 (left), Figure 2 (right): Not only is the navigation bar not very noticeable, you also have to scroll all the way back up to find it again. Regarding the navigation bar, I recommend that Nicki’s UI/UX designers 1) place the navigation bar the top of the page to improve initial visibility 2) fix the navigation bar at the top of the page but allow the other parts of the page to scroll down and 3) allow the navigation bar to remain similar to the theme whenever the background is pink and white, but change into something more solid and differentiable when the user visits a page that is not the original pink-and-white background. A good example is http://www.cardibofficial.com/. On Cardi B’s website, the navigation bar only solidifies into a more visually separate element of the website when one scrolls down. White text of navigation bar blends into image, background is part of the image of Cardi (before scrolling down). Note even though the background is the same as the picture, there are shadows that make the navigation bar stand out. An overall critique I have is regarding the lack of use of 3D functionality for call-to-action buttons. On Figures 1 and 2, the uniformity makes looks very official, like a colored paper flyer. However, the utility of the website is not just to announce tour dates, but to encourage people to buy tickets for them. I recommend that the UI/UX make higher use of dimensionalism in order to make calls to action stand out. Also, I recommend that it wrap its CTA’s within shapes like boxes in order to point out that it is a button to be clicked on. Nicki’s calls to action don’t even appear to be buttons — they are simply black text that only change color when you hover over the words. Cardi B’s website has more prominent buttons. With a more flexible use of 3D, boxes, color, Cardi’s is significantly easier to use. I recommend instead putting the subscribe section into a text-box modal the way Cardi does. Overall, I think that if Nicki wants to prioritize her black-pink color schema, she should insure that all parts of her website are consistent with that theme. As you can see, the previous section in purple clashes with the design, which is inconsistent with the theme. I recommend just stating it in black text instead. At the end of the day, I’m still Team Nicki. Let’s just give the Queen the website she deserves.